Let's start with two blaring examples of wars that were caused based upon false stories. It is naïve to believe the media was duped into believing the false reports. They were willing accomplices. The media hides their complicity by later reporting accurately, so that they can appear to now be the good guys. Nayirah Kuwaiti AKA (also known as) Kuwait's ambassadors daughter of a Kuwait royal family received actor training from a PR firm Hill & Nolton. She bore false witness about babies being murdered by Iraqi soldiers in Kuwait. In 2003 defense secretary Robert McNamara admitted the Gulf of Tonkin attacks never happened. President Johnson knew the alleged attacks were false. President Johnson use the Gulf of Tonkin reports to escalate the war in Vietnam. This is another case of bearing false witness and having the media go along with it. Now the most blaring current cases which proved beyond a shadow of a doubt interlocking mainstream media bias. Actually bias is the wrong term. Since the executives are aware of the falsehood of the reports lying is more accurate, but I will use the softer term bias since it is more accepted. The 2016 presidential smear campaign against Donald Trump reflects the existence of falsehood problem. If it were not for alternative Internet media exposing media lies Donald Trump would never have been elected president. President Trump candidacy represented a perfect storm where the left and right wings of established political parties felt threatened as did the deep state government. That is why the mainstream media feels comfortable using blatant covert misinformation campaigns against President Trump. Everyone that has power is on their side or so they believe! They have underestimated the power of alternate internet media and the power of the people when the people awake to a issue. The election of Mr. Trump is proof. Prime example media bias/lies. 2017 please examine what President Trump said about the Charlottesville Virginia riots. Then examine what the mainstream media reported that he said! 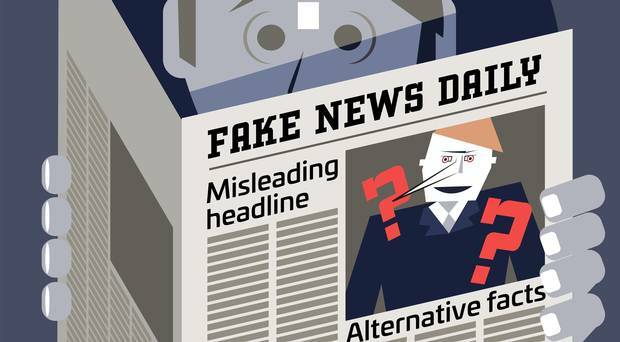 It is easy to see how the term fake news applies to the mainstream media. Fake news is what the mainstream media hoped to label the alternative Internet media. But there are too many inform citizens so the plot backfired on the mainstream media and they have now earned the just label, of being the real fake media. Here are two links first is CNN commentator Don Lemon describing a speech President Trump gave in Arizona after Charlottesville. View Don Lemon’s short clip then listen to the actual speech. It is obvious Lemon’s comments are scripted to deceive a ill informed public. Interlocking Media Bias Promoting Violence & Falsehoods Let's start with two blaring examples of wars that were caused based upon false stories. It is naïve to believe the media was duped into believing the false reports. They were willing accomplices. The media hides their complicity by later reporting accurately, so that they can appear to now be the good guys. I have two suggestions for those who think this is not a serious problem. First read George Orwell's novel 1984. My second suggestion is to look at the 10 Commandments. #9. You shall not bear false witness against your neighbor. The solution for the fake mainstream media problem is being worked out through our marvelous free enterprise system which we enjoy in the United States. The mainstream media is losing credibility and viewers. But there is an additional twist to this solution which needs to be addressed which is covered in my next topic of Internet Political Censorship.